What does it take to build a thriving technology company – and an environment in which black techies, their financial backers and their markets can flourish? That question underpins the new VOA documentary "Beyond the Unicorn." 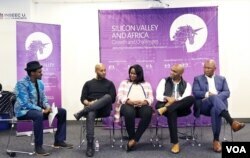 Subtitled "Africans Making IT in Silicon Valley," it explores how some Africans and African-Americans are finding their way in the tech sector's global capital in California. The 26-minute documentary profiles several entrepreneurs and venture capitalists and how they overcome hurdles. Its screening Wednesday evening, at a VOA event at the San Francisco campus of the French university INSEEC U., served as a springboard for a panel discussion spanning market potential, funding gaps and hiring disparities. First, a definition for the uninitiated. A unicorn is a private startup technology firm valued at $1 billion or more. Once rare, such companies have proliferated in the last few years, with almost 200 globally as of last May, according to Forbes. Silicon Valley has spawned herds of unicorns, such as Uber and Airbnb. Africa hasn't. With less readily available investment funding, "a unicorn might be quite unrealistic for an entrepreneur in Africa to build very quickly," said venture capitalist Mbwana Alliy, who appears in the documentary. He suggested its counterpart might be a "zebracorn." "Does that mean it's a $100 million startup? Maybe that's more achievable for an entrepreneur," said Alliy, founder of the Africa-focused Savannah Fund. "And it's still a major outcome." Panelist Stephen Ozoigbo proposed another term: gazelle, "something real and indigenous." "If it's a gazelle, then you're sure it would outrun, it would outhustle" the competition, said Ozoigbo, CEO of the African Technology Foundation. The continent has some fast-growing economies – think Ethiopia and Nigeria – and the world's fastest-growing population. More than half of its countries are expected to double their head counts by 2050, the United Nations reports. No wonder investment in African tech ventures is surging. Figures vary: The Disrupt Africa news portal says African tech startups raised more than $195 million last year, up from almost $130 million in 2016. Partech Ventures reports even stronger growth. The global venture capital firm, which has offices in San Francisco and Dakar, Senegal, reports that 124 tech startups drew $560 million in equity in 2017, up from almost $367 million for 74 startups the previous year. Still, Africa gets only a very tiny share of global private equity capital, said Andile Ngcaba, a panelist and founder of the African tech investment management fund Convergence Partners. That's just one of the challenges for Africans and African-Americans in tech. Blacks account for just 3 percent of the workforce among Silicon Valley's top 75 tech companies, an underrepresentation so striking that it has drawn public condemnation and scrutiny by the U.S. Equal Employment Opportunity Commission in a 2016 report. The male-dominated tech sector can be even less welcoming to black females. "Being an African woman in Silicon Valley ... has been very difficult. I actually had an easier time in Nigeria," said Bukola Akinfaderin, a senior developer – and the only black female mobile engineer – for the genealogy website Ancestry.com. She said her homeland's tech sector has less of a gender imbalance. Akinfaderin, featured in the documentary, finds support in groups such as dev/color, a nonprofit for black software engineers. She gets encouragement to revive Jandus Radio, her app enabling the African diaspora to hear live radio from the continent. It had as many as 500,000 users by 2016, when the hosting company's server malfunctioned and deleted the app's database. She plans to reboot the app as KinFolk. Akinfaderin touts the value of being an African woman engineer working in Silicon Valley. "When you're building a product – especially if it's a consumer-facing product, one that's international – you are going to need perspective from everyone." Mentoring and networking can make all the difference in finding opportunities, said Nate Yohannes, a Microsoft business development director for artificial intelligence – and the evening’s keynote speaker. “Coming to the United States as a child of [Eritrean] refugees,” he said, he couldn’t always rely on his parents’ guidance because of their unfamiliarity with the new setting. So, he sought out mentors, who helped shape his trajectory from law school to a Wall Street job to the U.S. Small Business Association to Microsoft. “It’s on us” to help each other and connect the continents, Yohannes told the scores of people, including other Africans, in the screening room. Africa's rapid population growth heightens the need to educate African youths so they can compete for work globally, said Convergence Partners' Ngcaba. He added that those aspiring to the tech sector will need training in, say, data science, machine learning and artificial intelligence. "That's the only way we can position ourselves in the global landscape," Ngcaba said. Skills, opportunity and capital are vital for entrepreneurs, agreed Yonas Beshawred, founder and CEO of StackShare, an online marketplace for comparing engineering tools and software. But, he added, "I think the most important thing is that you have something that you're passionate about and you start working on it … instead of just talking." The "Unicorn" screening event also served as a showcase for VOA's commitment to "telling America's story" along with providing accurate news and information to countries without independent media, VOA director Amanda Bennett said. "And what is more American than the American diaspora, the people who come here from places around the world looking for something and looking to give something, looking to be someone? And what is more American than technology?" she asked rhetorically in her introductory remarks, pointing out that VOA opened a Silicon Valley office last spring.